Terrence McNally has written the scripts of Broadway plays and musicals for 60 years, he has been involved in the struggle for LGBT rights, has suffered addiction and recovery, has found true love and seems to be always looking for inspiration. 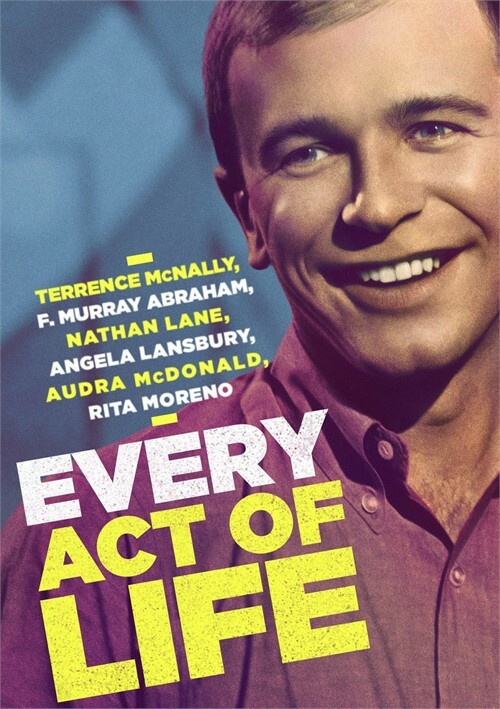 "Every Act of Life" is his story. He is a recipient of the Dramatists Guild Lifetime Achievement Award and the Lucille Lortel Lifetime Achievement Award. He has won four Tony Awards for his plays Love! Valour! Compassion! and Master Class and his musical books for Kiss of the Spider Woman and Ragtime. He won an Emmy Award for Andre's Mother. He wrote the libretto for the operas Great Scott and Dead Man Walking. "Playwright Terrence McNally is living NYC history" yet he runs from the spotlight. He is a shy, modest man who lets his writing say what the want to say. Director Jeff Kaufman interviewed many of McNally's friends and colleagues, including F. Murray Abraham, Lynn Ahrens, Jon Robin Baitz, Christine Baranski, Zoe Caldwell, Dominic Cuskern, Tyne Daly, Edie Falco, Stephen Flaherty, John Glover, Anthony Heald, John Benjamin Hickey, Sheryl Kaller, John Kander, Roberta Kaplan, Tom Kirdahy, Larry Kramer, Nathan Lane, Angela Lansbury, Paul Libin, Joe Mantello, Marin Mazzie, Audra McDonald, Peter McNally, Lynne Meadow, Rita Moreno, Jack O'Brien, Billy Porter, Chita Rivera, Doris Roberts, Don Roos, John Slattery, Micah Stock, Richard Thomas, John Tillinger, Stanley Tucci, and Patrick Wilson, plus the voices of Dan Bucatinsky, Bryan Cranston and Meryl Streep. Kaufman met McNally while he was filming "The State of Marriage" about the struggle for marriage equality. That film is set in Vermont, the first state to allow civil unions. McNally and his partner, producer Tom Kirdahy, were married there in 2003, and make a brief appearance in the movie. Kaufman understood that McNally doesn't like to talk about his personal life but once it was decided to male this movie, McNally held nothing back. McNally's story, is also a portrait of what life is like in the theater and the history of New York City over the past 50 years. McNally came to New York from Corpus Christi, Texas in 1956 to attend Columbia University, where his teachers included Mark Van Doren and Eric Bentley. At a party one night he met Edward Albee, who'd just written "The Zoo Story." At about 2?a.m., Albee invited him to his apartment for a drink. He had no idea that Albee was gay. They went on to live together while Albee worked on "Who's Afraid of Virginia Woolf?" Their relationship was filled with too much drinking and it did not last. When they broke up, Albee told him to stay away from the West Village. Eventually, they reconciled and McNally was one of the last people to visit Albee before he died. McNally's own career took off in 1965 with "And Things That Go Bump in the Night," which probably was the first play to put an open and positive gay character onstage. McNally tells us that alcohol nearly destroyed him. He stopped writing and spent most of his time drinking. Once sober, McNally solidified his position as a major American playwright with "The Lisbon Traviata" in 1989, followed by "Lips," "Love!" and "Master Class." At 78, Terrence is one of the world's most renowned, risk-taking playwrights, but he wakes up every day with the spirit of an ambitious and romantic young man. His attitude toward life mixed with a quiet courage is what empowered him to be the first proudly open major American gay playwright. His plays are about sexuality, homophobia, faith, the power of art, and finding meaning in every moment of life. "McNally has had long relationships with Edward Albee and Wendy Wasserstein; lost a lover and many friends to AIDS; stopped drinking through the intervention of Angela Lansbury; helped launch the careers of Nathan Lane, F. Murray Abraham, Audra McDonald, Doris Roberts, Patrick Wilson, and Joe Mantello; was an early champion of marriage equality and faced violent protests for his play "Corpus Christi"; survived a brutal fight with lung cancer; and finally found lasting love with his now-husband, producer Tom Kirdahy." His plays, books for musicals, opera librettos, and screenplays include: And Things That Go Bump in the Night (1964), Next (1969), Where Has Tommy Flowers Gone? (1971), Bad Habits (1974), The Ritz (1975), The Rink (1984), Frankie and Johnny in the Clair de Lune (1987), It's Only a Play (1986 and 2014), Andre's Mother (1988), The Lisbon Traviata (1989), Lips Together, Teeth Apart (1991), Kiss of the Spider Woman (1993), A Perfect Ganesh (1993), Love! Valour! Compassion! (1995), Master Class (1996), Ragtime (1998), Corpus Christi (1998), Dead Man Walking (2000), The Full Monty (2000), Unusual Acts of Devotion (2008), The Visit (2001 / 2015), And Away We Go (2012), Mothers and Sons (2014), and Anastasia (2017). He is currently working on three new plays. 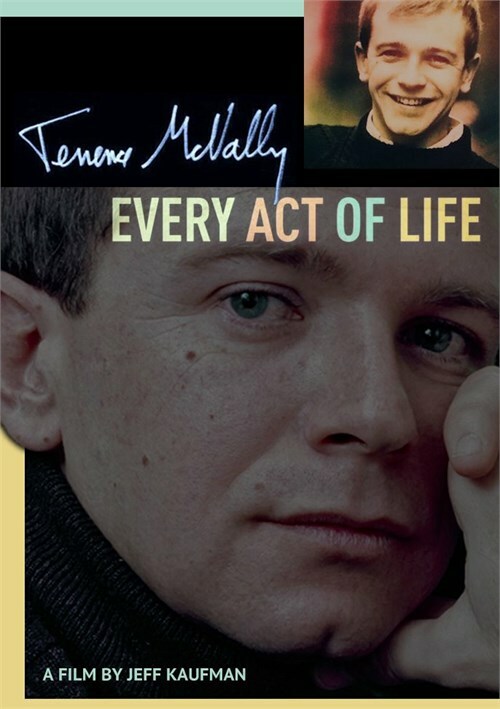 Broadway actor Audra McDonald says that "You cannot tell the history of the American theater without celebrating the work of Terrence McNally."